Cream the butter and sugar until very light and fluffy. Add the eggs one at a time beating well after each addition. Mix in vanilla. Sift the cocoa, flour and bicarbonate of soda. Add to the creamed mixture alternately with the buttermilk. It should form a stiff batter. Spoon the mixture into a piping bag with a plain 1cm nozzle. Pipe blobs onto a baking tray lined with non stick baking paper. Space the blob apart to allow room for slight spreading of the mixture. Bake at 180°C for 7-10 minutes until firm to the touch. Remove and cool, sandwich 2 sections together with the peanut butter filling. Filling: Cream together the butter and peanut butter until fluffy. Beat in the icing sugar and enough milk to make a stiff icing. 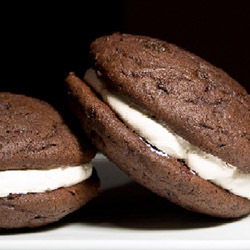 Pipe onto one half of the whoopie pie and top with another. If desired sift over a little cocoa powder. Reprinted with permission of Sasko Flour SA.